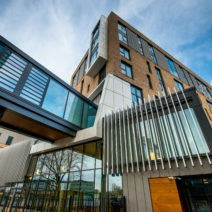 The scheme is built over two sites, featuring a glazed footbridge crossing a busy road that connects two existing, remodelled residential tower blocks. Developed by Wythenshawe Community Housing Group, the Village boasts 135 apartments complete with 24-hour on-site Extra Care to support residents existing and on going needs. Scheme Details Extra Care Scheme building comprising four multi storey apartment blocks including communal areas and a central community hub facility with a Bistro, Salon & Spa. The buildings are built on two separate adjacent sites straddling the main Hollyhedge Road. Both sites are connected via a stand out feature bridge.